Leading Manufacturer of brass bulkhead union, brass front & back ferrule set, union cross, front & back ferrule set, straight union and elbow union from Mumbai. 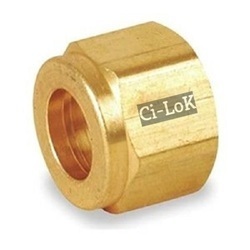 Size (inch) 1/8" to 3"
Brass Bulkhead Union is manufactured as per Double Ferrule Standard and is equivalent to Swagelok Fittings Union Bulkhead is used where panel or deck mounitng is required. Union cross compression tube fitting with a tube to tube union configuration, 316 stainless steel body material, and double ferrule construction. 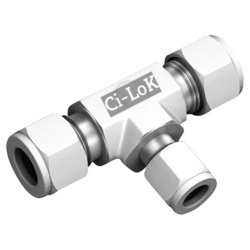 Ci-Lok tube fittings are designed using industrial codes and specifications with additional cutting-edge engineering on swaging action and sealing integrity. 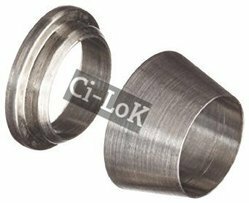 Ci-Lok provides excellent leak-free sealing on high pressure gas, vacuum, impulse, thermal shock, heavy vibration, and many other stringent applications. Straight Union is manufactured as per Double Ferrule Standard and equivalent to Swagelok It is used to connect 2 tubes in straight line. Union elbow compression tube fitting with a tube to tube union configuration, SS material and double ferrule construction. 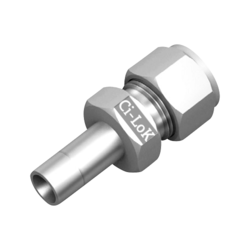 Ci-Lok tube fittings are designed using industrial codes and specifications with additional cutting-edge engineering on swaging action and sealing integrity. 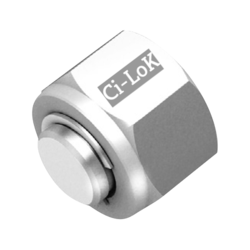 Ci-Lok provides excellent leak-free sealing on high pressure gas, vacuum, impulse, thermal shock, heavy vibration, and many other stringent applications. Tube End Closures made to international standards in a wide range to fit tubes of 6mm or Â¼ inch to 35/38 mm to 1-1/2 inches. These Pipe End Closures are manufactured by using the high density steel and brass to provide the leakage proof function. These Pipe End Closures are available in different lengths and diameters to serve varied applications and is made of finest quality. This range is available in various size and specification as per the requirement of the clients. Reducing union compression tube fitting with a tube to tube union configuration, SS material, and double ferrule construction. 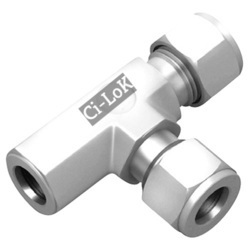 Ci-Lok tube fittings are designed using industrial codes and specifications with additional cutting-edge engineering on swaging action and sealing integrity. 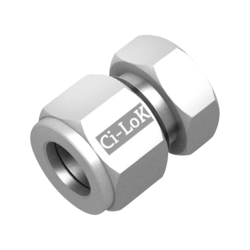 Ci-Lok provides excellent leak-free sealing on high pressure gas, vacuum, impulse, thermal shock, heavy vibration, and many other stringent applications. Reducer compression tube fitting with a tube stub connector configuration, SS material, and double ferrule construction. 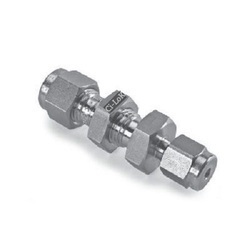 Reducing union tee compression tube fitting with a tube to tube union configuration, 316 stainless steel body material, and double ferrule construction. 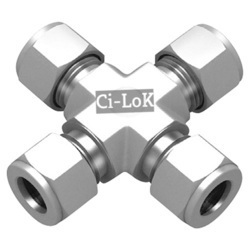 Ci-Lok tube fittings are designed using industrial codes and specifications with additional cutting-edge engineering on swaging action and sealing integrity. 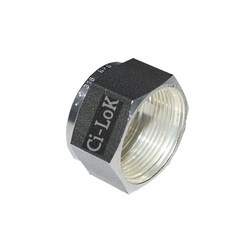 Ci-Lok provides excellent leak-free sealing on high pressure gas, vacuum, impulse, thermal shock, heavy vibration, and many other stringent applications. Male branch tee compression tube fitting with a tube to male pipe configuration, SS material, and double ferrule construction. 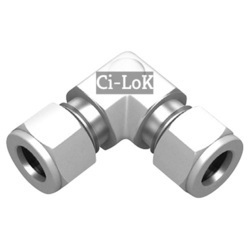 Bulkhead male connector compression tube fitting with a tube to male pipe configuration, 316 stainless steel body material, and double ferrule construction. 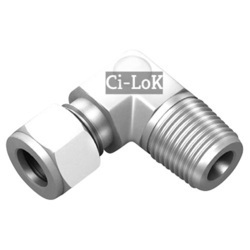 Male run tee compression tube fitting with a tube to male pipe configuration, 316 stainless steel body material, and double ferrule construction. 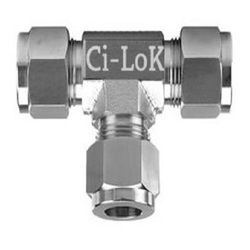 Ci-Lok tube fittings are designed using industrial codes and specifications with additional cutting-edge engineering on swaging action and sealing integrity. 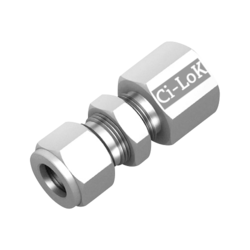 Ci-Lok provides excellent leak-free sealing on high pressure gas, vacuum, impulse, thermal shock, heavy vibration, and many other stringent applications. 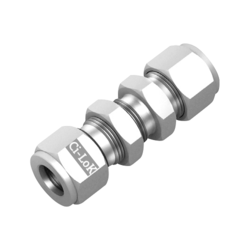 Bulkhead female connector compression tube fitting with a tube to female pipe configuration, 316 stainless steel body material, and double ferrule construction. Reducing union compression tube fitting with a tube to tube union configuration, SS body material, and double ferrule construction. . Female elbow compression tube fitting with a tube to female pipe configuration, SS material, and double ferrule construction. 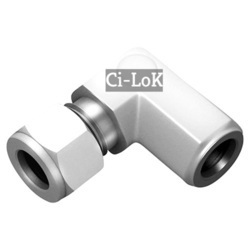 Male elbow compression tube fitting with a tube to male pipe configuration, SS material, and double ferrule construction. Fitting End Closures insures tube alignment with the fitting body axis and minimizes mechanical strain on the tube. 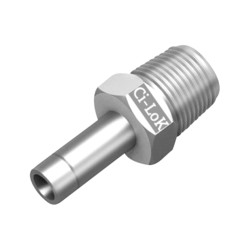 These Fitting End Closures are available for tube diameter from 6mm to 35/38mm and various varied inches. The high quality product is made in different materials and as per customer specifications as well. 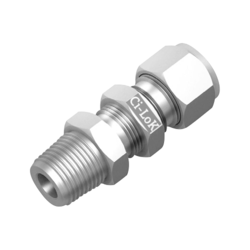 The double ferrule type tube fittings male adapter is Ci-LoK manufactured who boast a proven track record in high pressure fittings that demand high quality. Female run tee compression tube fitting with a tube to female pipe configuration, 316 stainless steel body material, and double ferrule construction. 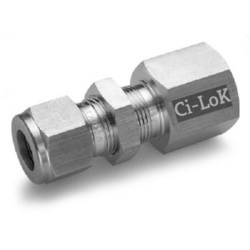 Ci-Lok tube fittings are designed using industrial codes and specifications with additional cutting-edge engineering on swaging action and sealing integrity. 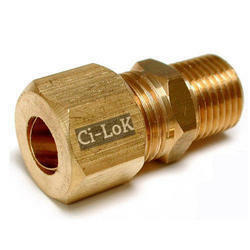 Ci-Lok provides excellent leak-free sealing on high pressure gas, vacuum, impulse, thermal shock, heavy vibration, and many other stringent applications. Female branch tee compression tube fitting with a tube to female pipe configuration, 316 stainless steel body material, and double ferrule construction. 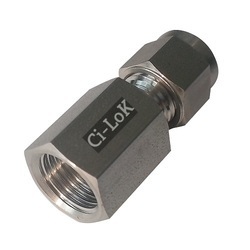 Ci-Lok tube fittings are designed using industrial codes and specifications with additional cutting-edge engineering on swaging action and sealing integrity. 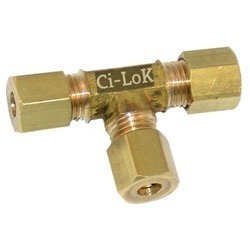 Ci-Lok provides excellent leak-free sealing on high pressure gas, vacuum, impulse, thermal shock, heavy vibration, and many other stringent applications. 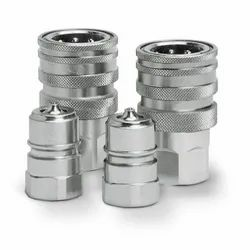 With an enormous year of information in this market, we are indulged in providing a highly superlative Male Connector.Accessible with us in a range of sizes and provisions, these presented fittings are broadly acclaimed. Together with this add, these are well checked prior getting shipped at the premises of our patrons within the pre-defined span of time. 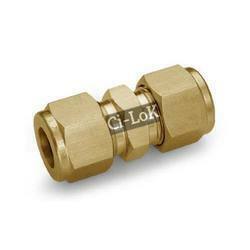 We are offering Bulkhead Union to our clients. 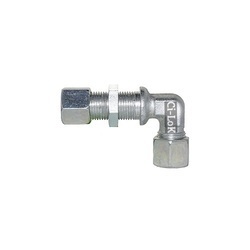 We export Double Ferrule Fittings world wide. Brass elbow compression tube fitting with a tube to tube union configuration, SS material and double ferrule construction. We are engrossed in presenting a wide variety of QRC Single Check Valves. Due to their elevated finish standards, simple installations and reliability; these offered valves are broadly acknowledged and cherished. To add, our customers can buy these from us at highly inexpensive rates in bulk. Double ferrule brass nut is for use with brass tubing to provide a leaktight seal for high pressure, vibration, and vacuum in gas or liquid applications. Has a 41 safety factor with respect to working pressure capabilities of the tubing used. For use in refineries, chemical processing, power generation, and instrument lines. With an enormous year of information in this market, we are indulged in providing a highly superlative Brass Male Connector.Accessible with us in a range of sizes and provisions, these presented fittings are broadly acclaimed. Together with this add, these are well checked prior getting shipped at the premises of our patrons within the pre-defined span of time. Double ferrule nut is for use with 304, 316, or 316L stainless steel tubing to provide a leak tight seal for high pressure, vibration, and vacuum in gas or liquid applications. Has a 41 safety factor with respect to working pressure capabilities of the tubing used. For use in refineries, chemical processing, power generation, and instrument lines. Connection of 2 tubes through a panel, with optimised sealing between the fitting and the panel. - individual unit quality control and dating in order to guarantee quality and traceability. Female connector compression tube fitting with a tube to female pipe configuration, SS material, and double ferrule construction.